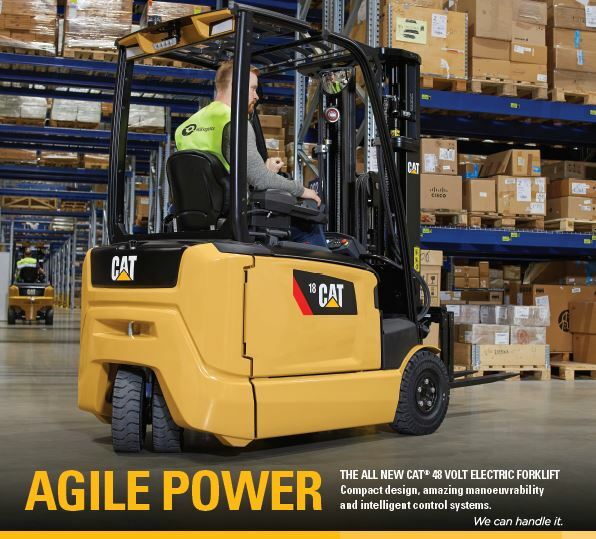 At the very forefront of intelligent lift truck technology, the new EP14-20AN compact range from Cat® Lift Trucks offers a great deal in a small package. If your handling operation has a need for space efficient compact lift trucks that are able to enhance operational efficiency, whilst adding helpfully to emissions reduction targets, (now a major concern for all MHE users) there really has never been a better time to acquire such a machine. That’s because recent technological advances have brought about a new generation of equipment, one that offers greater value than ever before in precisely these areas. With their very latest range of compact electric machines, Cat takes that value to a whole new level with a remarkable combination of capabilities and a mind-boggling amount of technological advancements all fitted as standard. Imagine a truck that ‘reads’ how the driver is operating the controls and then automatically adjusts its behaviour to optimise stability, safety and comfort. A truck that calculates and controls its fastest safe speed in any scenario, whilst preventing tilting or load imbalance to maximise productivity and driver comfort. A truck whose intelligent systems not only elevate productivity, but also operate more efficiently whilst pro-actively creating a safer environment for employees. Well, not only does this technology exist, but thanks to Cat it now comes as standard on a range of compact electric machines that won’t break the bank and can even operate in demanding conditions, both inside and out. Developments in sealing technology have been applied across numerous components to endow the tech-laden trucks with incredible durability that allows them to operate in the harshest of wet, dirty and dusty environments. For many operations, this could negate the need for a separate fleet of IC machines for external applications, which in turn could mean no more dirty diesels on site. Cat expects to see not only strong demand for the range across the food and drinks industries along with general warehousing – where Cat’s trucks have always proved popular – but also from the increasing trend for companies look to maximise the efficiency of their existing footprints. Manoeuvrability has been a core focus during the development of the range too, making the trucks a natural choice where space is restricted – such as inside containers and lorries or with drive-in racking. The supporting technology enables the machines to be used in such environments at higher speeds, while maintaining optimum stability and offering greater ease of use for their operators. However, the really clever stuff is to be found in the intelligent electronic control systems of the trucks, which has seen the integration of a number of Cat’s recent innovations. Responsive Drive System continuously monitors changes in the speed of pedal movements, dynamically adjusting performance parameters to ensure the truck’s movements are always smooth and controlled, including during stops and starts. Whilst the driver remains in complete control, his actions are safeguarded, giving confidence of operation. An Optimised Steering system constantly varies the power to the steering to give a consistent weight and feel, no matter what the speed of travel or level of activity. This makes the steering reassuring when moving at higher speeds, yet effortless at slower speeds for precise manoeuvrability. When turning, the truck employs its Advanced Curve Control to coordinate its two independent front drive motors and rear steer motor to optimise turning speed. The system also stabilises fast sideways movements of the counterweights and prevents tilting when straightening after higher speed turns. For even greater agility in turning there is a 360º steering option. This allows the truck to turn in the opposite direction without stopping or causing any destabilisation to the load, giving a more fluent ride and improving cycle times. A load-sensing hydraulic system automatically adjusts for weight to maintain precise control and provide a consistent level of feel regardless of load. Truck acceleration and hydraulic performance are automatically limited at lifts of 2 metres or more for steady, controlled handling. During lifts above 3 metres, passive sway control reduces mast sway and tilting to ensure stable and accurate handling to minimise time lost waiting for loads to settle. The use of the latest high efficiency motors with a high RPM range provides better precision and control during acceleration. They also create more torque at low speeds so reducing energy consumption. Uniquely, electronic magnetic brakes now come fitted as standard across the entire range. With no conventional brake pads, this system produces no brake dust and removes the subsequent risk of contamination, making them ideally suited to sensitive environments. A lack of pads also reduces servicing expenditure and delivers improved energy efficiency. The robust construction of the trucks, as well as the extensive sealing of components, means that the machines can also withstand higher operating temperature ranges and have a greater resistance to weathering and physical wear, all of which further reduces maintenance costs. Beyond the technology, the new range also delivers a new standard of cabin experience, with easy access and an unusually large range of seat and steering adjustments assuring the perfect driving position for every user. A cleverly inclined and narrow dashboard, one-spoke steering wheel and optimised free lift cylinder structure maximise forward, downward and side visibility. Clever details can be found across the ergonomically optimised trucks, such as low-fatigue pedals and a steering knob which automatically returns to 8 o’clock whenever the truck straightens, even when forced past its end stop. If that wasn’t enough, an extensive range of options include a compact chassis, 3 or 4 wheel configuration and rapid battery exchange allow the trucks to be further customised to perfectly fit their individual applications. Combine all of these features and advanced technologies with significant efficiency benefits, as well as a lower carbon footprint, and these versatile trucks will make a game-changing addition to any fleet. Bringing the biggest benefits to those that can take full advantage of all of their considerable capabilities. These compact machines really do punch well above their weight, combining high-tech brains with remarkable brawn in a very attractive package. What’s not to like?